what octane are you running with your shaved p79? what fuel delivery? timing? cam? hp? Well, that sounds impressive. How much time did you spend on making those? Just looking for a ball park estimate. Can I see a few images of your Z with the kit on it? And which kit is that/how much did you pay? Kinda looking around at a few at the moment. 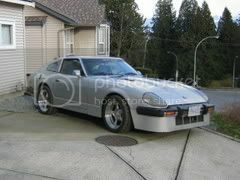 Hello, I have just registered for my father-in-law who has a 70 Z and would like to get some info and advise from others. Is there anything needed to post a new thread? thanks for your time. hey man can you tell me a little about your setup? Hey shady! I'm a little unclear about adding a blaster 2. do I need to remove anything/ add anything in order to keep this coil from frying anything else? I've read somewhere about removing a ballast resistor.... wondering if I can just swap in the Blaster 2 without changing anything. alright. Hey, what If i just buy a MS1? or any of the Megasquirts for that matter? How much hp can I can expect to see/ will it be worth it just for the fun of playing with it? thank you! it gives me things to think about. How much hp do you think you've got now? hey Shady, is there a place you have outlined everything you've done to your n/a engine? I'd like to see what i can do without switching to turbo.